I hope you've had a fabby weekend. It's been a soggy one here and normally that would be my perfect excuse to stay indoors and ink up, but by the time I've done those things that 'need' to be done it's late on Sunday and I've run out of time! Huge thanks Paper Crafts for the publication and as always thank you for stopping by today! Lovely pop of colour against the black! This is the neatest idea - I love it!!! I love buttons!! Well Lordy Bees that is a stunner girly - outa the park with that one!! Beautiful and clever, my crafty friend! I saw the card in the magazine. LOVE LOVE the idea of rainbow color buttons. I saw this in the magazine and I think it is such a great interactive card! Love how you used all the buttons! Super clever Aimes! Bold and fun Too! Wow what a genius idea Aimes, I love interactive cards! This card is fabuolous, I can see why it is your fave. 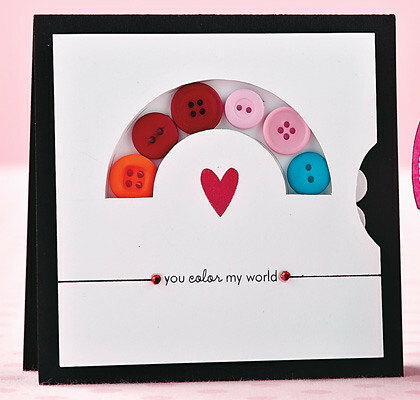 LOVE the buttons as a rainbow, truly inspired!